01182013_Becherer_IraqMedical017: Doctors of War: Casualties of War: Global News Portfolio: New Orleans based Photojournalist covering the Deep South and beyond. 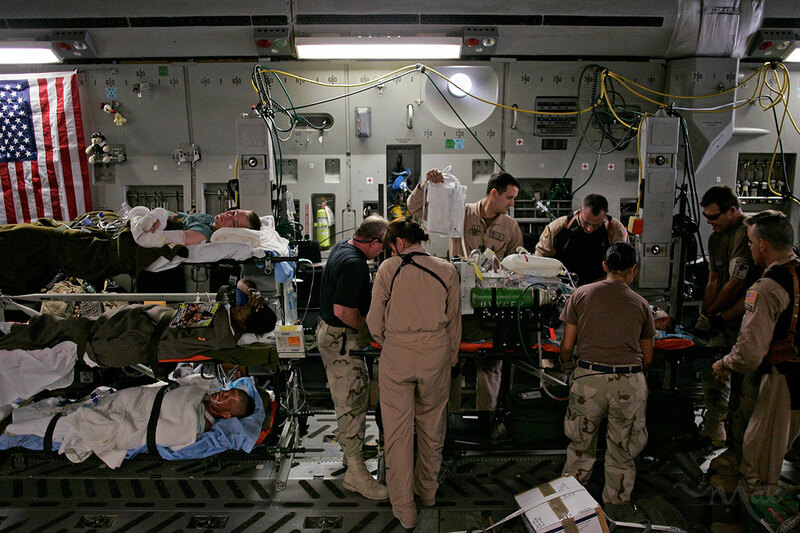 Wounded American soldiers are carefully placed onto a C-17 cargo aircraft by a Critical Care Aeromedical Team (CCAT) who will monitor and given medication to relax and ease the pain of air transport for the wounded. Thanks to the rapidity of the transport from the battlefield to the hospital, soldiers can expect a 96% chance of survival from their wounds once they make it to the hospital.